A philosopher, artist and professor, Lerda’s prolific work is partly travelling all the way from Turin, Italy to the US. As the result of an incredible love story for a life companion and for art and culture, Lerda’s investigation is being posthumously exhibited thanks to his wife and scholar Valeria Gennaro Lerda (my American history professor at Genova University) heroic investment. Coincidentally the opening of the show falls on San Valentine’s day. Lerda’s apprehension towards the art world certainly challenges us with the debate on the function of art. His suspicions towards the art world system did not stop him though to commit to art making. In over 40 years of practice, Lerda daily engaged with and tackled important and profound philosophical themes that materially manifest in mix media collages. These he would share with close friends and family and are now travelling across oceans. Spread the word to the world if you can! It is accompanied by the first exhibition catalogue in English on Lerda’s work. 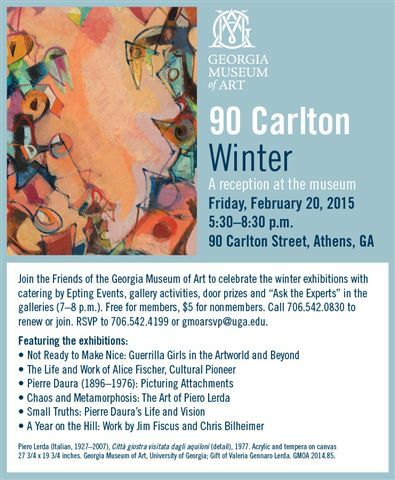 Georgia Museum of Art organizes Piero Lerda’s first U.S. exhibition Athens, Ga. – The Georgia Museum of Art at the University of Georgia will host the exhibition “Chaos & Metamorphosis: The Art of Piero Lerda” Feb. 14 to May 10, 2015. Lerda’s art draws on his personal experiences growing up in Italy during World War II and his interest in the eternal battle between chaos and order. Born in the Piedmont region of Italy in 1927, Lerda began learning under painter Vincenzo Alicandri, who taught him how to combine traditional and contemporary ideas and techniques. The violence Lerda witnessed as a student in Caraglio and Torino at the end of World War II influenced both his belief in existentialism and his work, which often portrays the hunting and trapping of men. In 1957, Lerda became director of the United States Information Service (USIS) library in Torino. The position gave him access to American literature and culture, which he shared with his friends and colleagues. Simultaneously, he continued to work on his art and had his first solo exhibition in 1962. Throughout Lerda’s career, he experimented with various types of materials, particularly collage. In the 1950s and 1960s, he used India ink and wax resist and focused on human violence as a theme. By the mid-1960s, he began incorporating kites and children’s toys in his art. These works seem more optimistic, yet the kites represent only an illusion of freedom, as they are unable to escape the chaotic world. His “merry-go-round cities” depict a world reconstructed by children after being destroyed by adults. His final series of works, which he created from the 1990s until his death in 2007, examines themes of chaos, creation and metamorphosis. Lerda’s wife, Valeria Gennaro Lerda, attended UGA on a Fulbright Scholarship in 1971 and played a major role in her husband’s work making its way into the collection of the museum. Gennaro Lerda and Valeri will deliver a joint gallery talk on Feb. 26 at 5:30 p.m. Other events associated with the exhibition include a Family Day (“Love and Lerda”) on Feb. 14 from 10 a.m. to noon, 90 Carlton: Winter (the museum’s quarterly reception; $5 nonmembers, free members) on Feb. 20 at 5:30 p.m., and a tour by Valeri on March 18 at 2 p.m. Events are free and open to the public unless otherwise specified. Museum Information Partial support for the exhibition and programs at the Georgia Museum of Art is provided by the Georgia Council for the Arts through appropriations of the Georgia General Assembly. The council is a partner agency of the National Endowment for the Arts. Individuals, foundations and corporations provide additional museum support through their gifts to the University of Georgia Foundation. The Georgia Museum of Art is located in the Performing and Visual Arts Complex on UGA’s East Campus. The address is 90 Carlton Street, Athens, Ga., 30602-1502. For more information, including hours, see georgiamuseum.org or call 706-542-4662.